I found this chair a few weeks back on Craigslist for $15. It was a little faded, but I knew that I could use it on our deck. I purchased some outdoor spray paint from Lowe's. Two cans of it cost me around $10.00 all together. After the first coat I could definitely tell the difference and the chair was beginning to have show some life again. I am thinking about redoing the cushions that it came with in the future, but for now they are in pretty good shape. I think I'm going to enjoy reading some books on this chair during naptime. 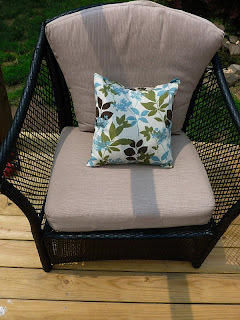 The total cost was approximately $25 for the entire chair redo. It wasn't in the budget to buy some furniture for the deck we are working on. Therefore, I'm happy I was able to get a budget friendly chair for it. That looks fabulous! Love the color. So much better now. Great Craigs list score in my book! I love how it turned out! Don't you just love spray paint?! Great job! Spraypaint can really transform just about anything! Looks like it came right out of Pier One! Love-Love-Love it!! What a transformation! I love it! Just dropping in from the hop and am now following you. I would love to invite you to link up this lovely chair to Freedom Fridays! So hoping to see you (and your chair) there. Thank you for sharing at Freedom Fridays. Have a marvelous weekend. Great makeover! Looks like an inviting chair now! Oopps, meant to add...Thanks for linking to a Round Tuit! Great redo, so nice and fresh now. Thanks for sharing with the newbie party. I love this redo... I know what you mean, we're redoing our deck a little at at time too, so a find like that is awesome.. Thanks so much for linking up to ALL STARS MONDAY at Simply Done Wright.. I love what you share.. Your chair looks great! I have pinned it to my Home ideas board. I would love to have you come by, link up and show it off at the Creative Corner Hop. I'm glad you shared this post. I want some patio furniture and will likely be getting it through classifieds or Craig's List. You're chair makeover looks great....the chair looks new and expensive. I'm always amazed at how a little paint can have such a big impact. Your chair turned out perfect...and the price is right, too! Looks great! looking forward to the cushion redo. Thanks for linking up to the Creative Corner Blog Hop. Love the chair! Great job! I love the transformation so far and can't wait to see it with the new cushions. Thanks so much for sharing on Tout It Tuesday. It looks fantastic! Nice job! I love that pillow too. Spray paint gives it a whole new life! Thanks for sharing at Terrific Tuesdays. Obviously I'm not spending enough time on Craigslist! Nice makeover! Perfect for your deck! thanks so much for sharing this at the Naturally-Nifty Party!! Very Nice I love the pattern on the pillow!